In the Family History of a Once Prominent Public Man -- Betrayed by a Trusted Friend, He Seeks Satisfaction at the Pistol's Mouth. Chicago Special, of the thirty-first to the Cincinnati Enquirer: About two weeks ago, the Chicago papers published a Milwaukee dispatch, to the effect that John M. Binckley, who was assistant attorney-general under President Johnson -- who had lived in this city for some years, but who had resided in Milwaukee for twelve months or so -- had mysteriously disappeared; that it was unknown where he had gone, and that it was feared that he had committed suicide under the influence of mental excitement or aberration. This was followed in a couple of days by another dispatch, stating authoritatively that Mr. Binckley had not committed suicide, and was all right. The explanation of these dispatches came out to-day in this city before Justice Pollak. It is an episode excessively painful in its nature, in view of the standing of all parties involved. 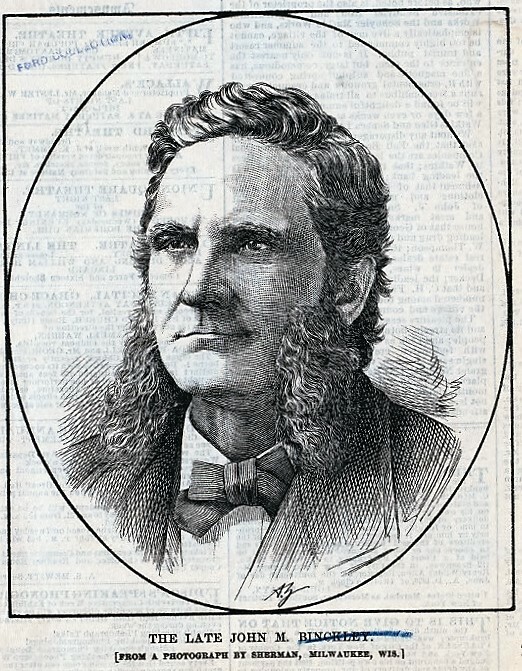 During 1874 and 1875, Mr. Binckley lived with his family in Irving Park, near Chicago. During their residence there they got acquainted [with] Mr. J. W. Tape, a young doctor, who had been appointed physician of the poor house and insane asylum by Dr. Ben Miller, in the spring of 1872, soon after Miller was elected County superintendent of public charities. The doctor and Binckley family were on terms of reasonable intimacy, but no one had ever heard of impropriety until three weeks ago. About this time, it is alleged, Binckley said he discovered in some unknown manner that his wife had been guilty of too much intimacy with Dr. Tape. He charged her with the fact, an it is further alleged that she, at his dictation, wrote a confession of her misdeeds. Subsequently, however, she repudiated this confession, and asserted that it was made under threats. Then she left and went to her folks in Virginia. Her father, Harvey Mitchell, who was for many years a draftsman in the land office, is dead. Her mother was a daughter of Gov. [Judge Peter] Johnston, of Virginia, and a sister of General Joseph Johnston. John M. Binckley of this city, formerly a resident of your city, left here this morning for your city with murderous designs on Dr. John Tape, of Oak Park. Jealousy the cause. Notify Tape at once. SIR. Last Sunday, a week past, I called at your lodging, about sunset, and was invited to wait in your room. I chose not to stain a blameless fireside with your blood, and left word for you to meet me at the depot, where (knowing you always carried arms) I intended to make you fight. The police protected you. Since I have been dogged night and day. On the twenty-second instant I wrote to you, offering to appear at the house of one of your Masonic brethren, unarmed, for a private personal interview. You have not responded. No living person knew my object. I reserved it to you. It was to make an unlawful proposal. If you are cowardly you will now have my liberty in your power, for, finding no other way, I avow here by my proposal, which is for a mortal combat. As I can invite no friend to expose himself in Illinois, it must necessarily be a secret meeting between us, which is not prescribing terms. This I do prescribe, and nothing else, viz: The fight must go on until one is dead. Now all the rest is with you, and as you know yourself to be uncommonly deft and skillful, you perceive your immense advantage over bungling strength. Make everything to please yourself but I limit the time to ten days after notice. If you evade this, I will, I must, adopt another way. No person as yet has ever heard from me the reason of my hostility. Am answer to this will reach me directed to the care of Hon. S. F. Norton, No. 69 Dearborn Street, Chicago, who will not imagine the contents. Respectfully, JOHN M. BINCKLEY. He received this Friday or Saturday, and went to Justice Pollak to-day and swore out a warrant for Binckley's arrest on the charge of having sent a challenge to fight a duel, which is an offense punishable with the penitentiary or a heavy fine. Binckley was found, arrested, and taken to the justice's office, where his letter to Tape was produced. Binckley admitted that he wrote it, and said he didn't regret having sent it. So Justice Pollak ordered Binckley to give bail in the sum of three thousand dollars, which was given.